BOSTON — The 2008 financial crisis convinced most people in the world of central banking that it would be a good idea to try to prevent that kind of thing from happening again. But policy makers have made little progress in figuring out how they might actually do so, a troubling reality highlighted at a conference that ended over the weekend at the Federal Reserve Bank of Boston. The Fed has publicly committed itself to a strategy of so-called macroprudential regulation, meaning it is now focused on maintaining the stability of the financial system as well as the health of individual firms. But senior Fed officials at the Boston conference described that as more of a goal than an achievement. Crises remain hard to anticipate and prevent, and the available tools could cause significant economic damage. “My own view is that while the use of macroprudential tools holds promise, we are a long way from being able to successfully use such tools in the United States,” William C. Dudley, president of the Federal Reserve Bank of New York, told the conference. In the meantime, the importance of prevention has only increased because the Fed’s ability to respond to the outbreak of a crisis has diminished. The 2010 Dodd-Frank Act prevents the Fed from repeating some aspects of its 2008 actions. More important, the Fed expects interest rates to remain below historic norms for the foreseeable future, leaving less room to cut rates, which has long been its first line of defense. Donald Kohn, a former Fed vice chairman, said he was troubled by the gap between perception and reality. “If you ask people who is responsible for financial stability they would say, ‘The Fed,’ ” said Mr. Kohn, a senior fellow in economic studies at the Brookings Institution. “But the Fed doesn’t really have the instruments. It doesn’t really have the tools. The obvious reason to prevent bubbles is that crises are bad for the economy. Seven years after the peak of the 2008 crisis, the Fed still has not been able to drive unemployment or inflation back to normal levels. The unemployment rate has fallen to 5.1 percent — a level usually associated in the past with a robust economy — but that figure overstates the current health of the labor market. Prices, meanwhile, rose just 0.3 percent in the 12-month period ending in August, far below the 2 percent level the Fed would like to achieve to support healthy spending and investment. The basic problem for regulators is that crises are hard to predict. A 2012 study by the International Monetary Fund concluded that only about one-third of credit booms ended in crashes. Many instead produced permanent economic benefits. And even in retrospect, the researchers found it hard to identify clear warning signs. So popping bubbles probably means curtailing some beneficial booms, too. “We’ll have to make a choice about how much growth we are willing to give up in good times to limit the likelihood of a future financial crisis,” said Loretta J. Mester, president of the Federal Reserve Bank of Cleveland. Other officials and experts also share Mr. Dudley’s doubts about the Fed’s power to pop bubbles. American regulators have fewer tools than some of their European counterparts, and those tools are distributed among a number of agencies that have little history of cooperating either quickly or effectively. Frederic S. Mishkin, a former Fed governor, noted that financial firms tend to resist increased regulation, often with considerable success. “They’re going to hire a lot of lawyers to figure out how to get around these regulations and undermine them,” Mr. Mishkin, a Columbia University economist, said. These constraints on the Fed’s ability to recognize and respond to problems as they are developing has led officials to emphasize measures that strengthen the resilience of the financial system. A prominent example: stricter limits on banks’ reliance on borrowed money. Mr. Dudley said progress in this area should provide “considerable solace” to those worried about the slow progress of macroprudential regulation. Some officials, however, argue that a more drastic shift may be necessary. They want the Fed to use its most powerful tool — raising and lowering interest rates — to help maintain the stability of financial markets. The Fed might curb speculative excesses by raising interest rates. Similarly, it could soothe fragile financial markets by holding rates steady, as it is doing now, or by cutting rates, as it does during downturns. Janet L. Yellen, the Fed’s chairwoman, has generally resisted this suggestion, arguing in a 2014 speech that monetary policy should remain focused on moderating inflation and minimizing unemployment. Raising interest rates across the economy to limit speculation in a particular area is the rough equivalent of weeding a garden with a bulldozer. Ms. Yellen has suggested she would consider it only as a last resort. But Ms. Yellen’s deputy, the Fed vice chairman Stanley Fischer, said on Friday at the Boston conference that the use of monetary policy for such goals deserves consideration. “There may be times when adjustments to monetary policy should be discussed as a means to curb risks to financial stability,” he said. Jeremy C. Stein, a former Fed governor, has argued that the broader effects of raising interest rates actually numbers among its virtues, because it potentially enables the Fed to discourage risky speculation it has not even managed to identify. 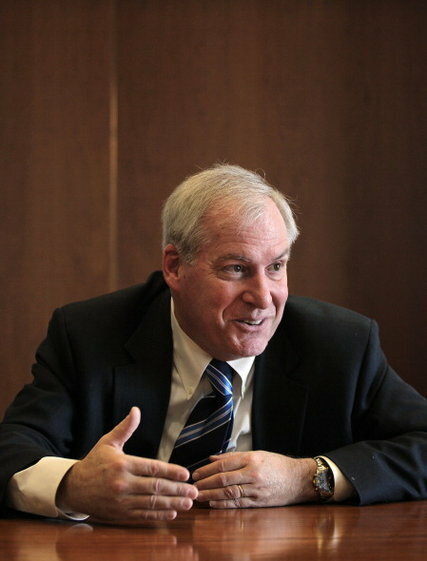 Eric S. Rosengren, the Boston Fed president, argued in a paper that opened the conference that financial stability should join inflation and employment as explicit objectives of monetary policy. Moreover, Mr. Rosengren and his co-authors presented evidence that the Fed already treats financial stability as a goal. They showed that the movement of the Fed’s benchmark rate tracks discussions of financial stability at Fed policy-making sessions. Others, however, said it was not clear that raising rates was a more effective means of addressing risks to the financial system than sensible regulation. The current discussion is largely framed by the details of the last crisis. Mark Gertler, a professor of economics at New York University, said he saw little reason to think the Fed could have curbed the rise of housing prices in the years leading up to the 2008 crisis by raising interest rates more quickly. He noted that Britain had higher rates than the United States and just as severe a housing bubble. Nellie Liang, director of the Fed’s office of Financial Stability Policy and Research, presented a study showing that changes in interest rates have a limited effect on credit booms in the early stages, and then even that fades away. That suggested that macroprudential measures had a role to play. But the skeptics held sway. Luc Laeven, director general for research at the European Central Bank, provided a fitting, if disheartening, summary of the conference. “Both monetary policy and macroprudential policy are not really very effective,” Mr. Laeven said.